Rushanara Ali has served as Labour MP for Bethnal Green and Bow since 2010. Recently in the June 2017 General Election, Rupa received 42,969 votes, which equaled a 71.8% majority, retaining her seat. Rushanara was born 14 March 1975 in Bangladesh, she began her career as a Research Assistant to Michael Young, working on a project which paved the way for the establishment of Tower Hamlets Summer University, offering independent learning programmes for young people aged 11-25. She also helped to develop "Language Line", a national telephone interpreting service in over 100 languages. Between 1997-1999 she was also Parliamentary Assistant to Oona King, the then MP for Bethnal Green and Bow. She worked on human rights issues at the Foreign Office from 2000-2001. Prior to this, Ali was a Research Fellow at the Institute of Public Policy Research (IPPR) focusing on anti-discrimination issues from 1999-2002. From 2002-2005, Ali worked at the Communities Directorate of the Home Office, leading a work programme to mobilise local and national agencies in the aftermath of the 2001 riots in Burnley, Bradford and Oldham. This aimed to prevent further conflict and unrest; challenging central Government to provide appropriate support to these areas. Rusharnara later became associate Director of the Young Foundation. She was elected MP for Bethnal Green and Bow with a majority of over 11,000 votes. 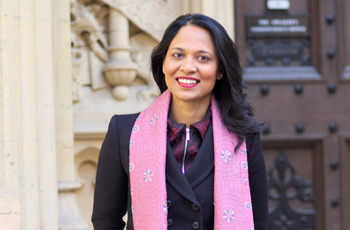 She is the first person of Bangladeshi origin to have been elected to the House of Commons and along with Shabana Mahmood and Yasmin Qureshi, became one of the United Kingdom's first female Muslim MPs. Rushanara has previously served as a Shadow Minister for Education and as a Shadow Minister for International Development.